India Bridal Fashion Week 2013 is on and we are busy with attending the shows and satiating our fashion cravings. First day as most of us know saw enough chaos and delay. There was gossip that Kangana Ranaut, the showstopper for JJ Valaya caused the ruckus as a result of being unprofessionally late. However, that is not something we much care about. Let´s see what the first day openers JJ Valaya and Shantanu and Nikhil had to show us. Starting with JJ Valaya, his collection,‘The Maharaja of Madrid’ drew inspirations from Spain. The show interestingly started with the music of birds chirping in the background and a male model playing a trumpet on a ship that was strategically placed in the middle. This was followed by kathakali dancers in synchronization with another dancer in a red gown who did a Spanish foot tapping dance. The setup and music composition clearly indicated the cultural fusion. 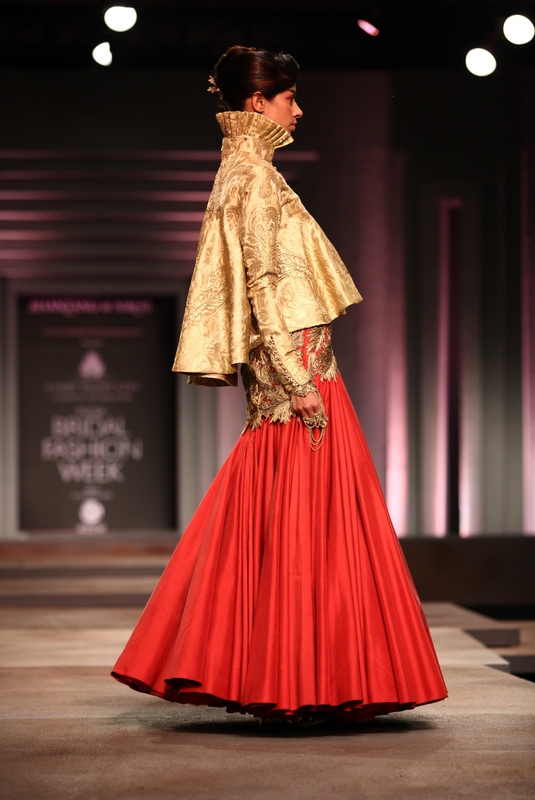 The collection saw use of laces, headgears, coats over sarees, ivory, huge fringes, floral prints and tule. My personal favourite were the blue tule gowns. There was also velvet to be seen like last year. 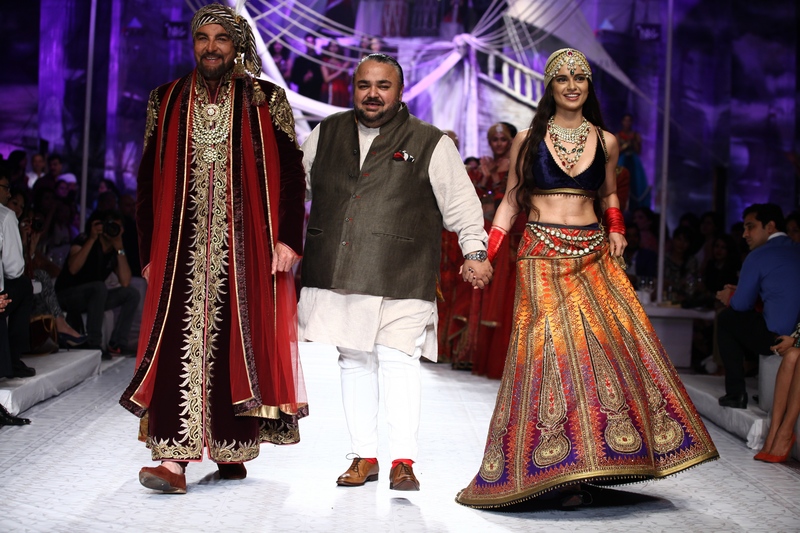 In fact Kabir Bedi who was one of the showstoppers walked the ramp in royal velvet shervani with gold work. The show ended with Kangana Ranaut wearing a floor sweeping lehenga in gold work and paisley patterns. She also spotted a turban adding to the princess like look. The second show was by the stylish duo, Shantanu & Nikhil who with their collection, ´To Die For´, defined the renaissance period with a modern twist. The silhouettes were fresh with the classic opulence of gold work all over. The collection overall reflected femininity and softness. 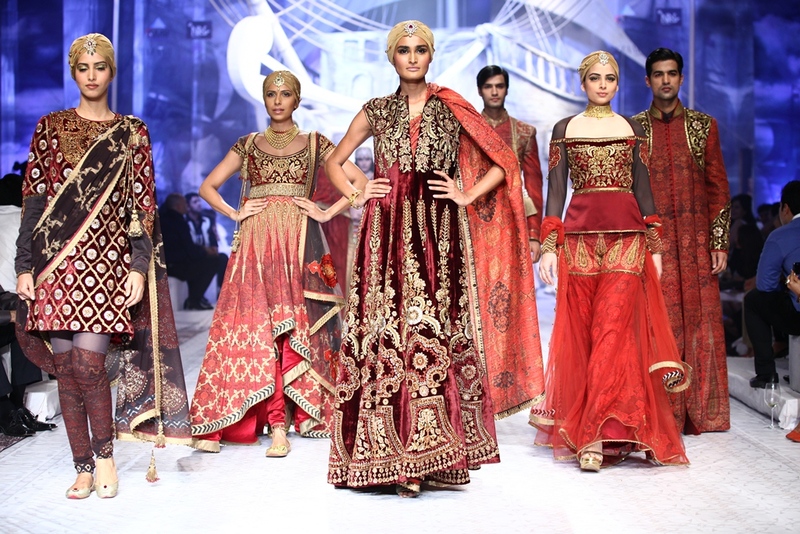 The collection had luxurious gowns, lehenas, anarkalis and all that the bride of today can ask for. My pick from the collection would be the the use of peplum tops over lehengas. The show was closed by Miss Canad, Seher Biniaz who wore a soft blush pink colour evening gown with beautiful use of French Chantilly lace. This entry was posted in Beauty, Design, Fashion, Luxury, News, Shopping and tagged Anarkali, Bride, Fashion Trends, Gowns, India Bridal Fashion Week, Indian Designers, JJ Valaya, Kabir Bedi, Kangana Ranaut, Lehengas, Peplum, Royal, Shantanu and Nikhil, Trousseau, Tule. Bookmark the permalink.